Welcome to our window cleaning company in Bankside SE1. We appreciate your interest in our affordable service. We can help you bring your windows back to shine in no time. Whether it’s early spring, late autumn or you are just preparing for an occasion, it never hurts to improve the look of the premises. Window cleaning can make a huge difference. Luckily, we have a dependable and affordable service to suit your needs. We are open seven days a week and we offer a worry-free solution. We suggest you dial our contact number to make an appointment. 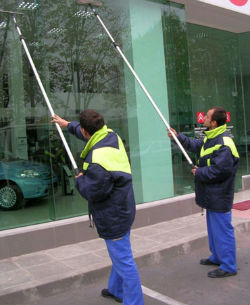 We know that you are counting on us to restore the shine to your windows. That’s why we have no choice but to offer a 100% professional window cleaning service in Bankside. From start to finish, we work hard to get the best results. We will work continuously to get all the dirt out of your windows, both on the inside and on the outside. Aside from the fact that a window looks better when it’s clean, it is also essential to remove grime and dirt from the surface because glass is porous. If you don’t take care of it, in time dirt will become permanent and no one will be able to get rid of it, even a professional service. We are experts at window cleaning in Bankside SE1 and we have seen a lot and done a lot of cleaning throughout the years. We have handled different situations and we have confidence that we can deal with any cleaning job. We urge you to take a close look at our company and pick up a service. We promise to go above and beyond your expectations. Our service is high-quality and we think you will be delighted. But enough of talking, let’s get cleaning. Make sure to schedule right away and we’ll come by to tackle your windows.